Funny how Spirit leads the way. A couple of weeks ago I got message, “we will teach you about sacred geometry” (See post on Sacred Geometry). Since then, books and sites have come my way that didn’t seem to be about scared geometry and yet, they’ve held lessons about the power of geometric shapes in the universe. 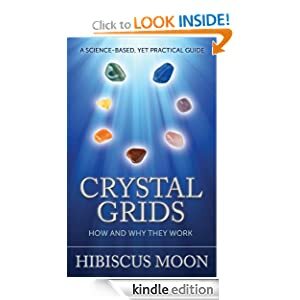 One such book is Crystal Grids: How and Why They Work by an author with the creative name of Hibiscus Moon. I’ve been following the Hibiscus Moon website for a while. She deals with crystals and stones in a myriad of ways. Her breezy style hides a geeky science teacher under the surface. I’ll bet she was a fabulous class room teacher. Now, the world is her student as she teaches through the Internet. Crystal Grids goes beyond most books about stones that simply tell about their supposed healing properties. This book goes into the science supporting the idea of energy in stones and the power of geometry throughout creation. Sacred geometry goes back to the Greek, Plato. He credits information from the lost continent of Atlantis for the five basic geometric patterns now called the Platonic Solids. These shapes can be found throughout nature and down to the smallest molecules. Crystals are formed in breathing taking geometric formations. According to Crystal Grids, placing them in geometric patterns can create an energy field. Using stones in this manner is not new. Indeed, it’s easy to see how people of the past were accused of being wizards and witches for employing what will probably be understood in scientific terms for energy transference in the not-so-distant future. If you’re interested in the emerging field of energy healing and vibrational medicine, Crystal Grids is a fascinating introduction to working with the medium of crystals and stones.